Season-ticket sales at Easter Road have soared past the 10,300 mark, reinforcing hopes that Hibs will hit a record number before Neil Lennon’s team play their first game on July 15. Club officials were expecting a further flurry of activity today by existing season-ticket holders rushing to secure their seat before the 5pm deadline when they go on general sale. If Hibs can top the 11,500 mark, it will break the record set during the 2007/08 season under Tony Mowbray. 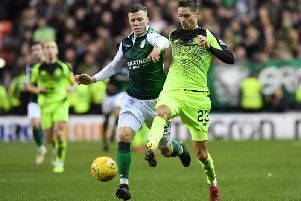 Today Greig Mailer, Hibs’ head of marketing and communications, revealed sales are currently running 28 per cent ahead of this time last year, effectively putting the club “two months ahead”. Describing the figures as “really encouraging”, Mailer also disclosed they include around 1500 fans who didn’t buy one last season. Admitting the “after glow” of winning the Scottish Cup for the first time in 114 years had undoubtedly helped sales last season, Mailer believes the feelgood factor continued as Hibs took the Championship title to ensure a return to the Premiership while mounting a strong defence of the cup, only losing narrowly in the semi-final to Aberdeen. He said: “To have sold more than 10,000 season tickets by the end of May is really encouraging. Sales tend to follow a certain pattern, the initial launch, the end of the early bird initiative and, now, today’s deadline for fans to renew their seats. “We’re expecting a further flurry today before that deadline passes and then more activity as fans perhaps look to move seats while there will be others who have perhaps been hanging on to see what seats become available. Hibs played before an average home gate of almost 15,500 in the Championship, with 19,764 turning up to see Lennon’s players lift the trophy on the final day of the season and Mailer believes that figure could well rise following promotion with the prospect of Edinburgh derbies and matches against Celtic and Rangers.